If you recently started playing South Park: Phone Destroyer, you may be wondering how to collect cards, upgrade your cards, and build brand new card decks. This is because one of the best ways to succeed in South Park: Phone Destroyer is by collecting new cards, upgrading them, and using your best cards to build winning card decks. If you’re having trouble in any of these areas, we’ve got you covered. 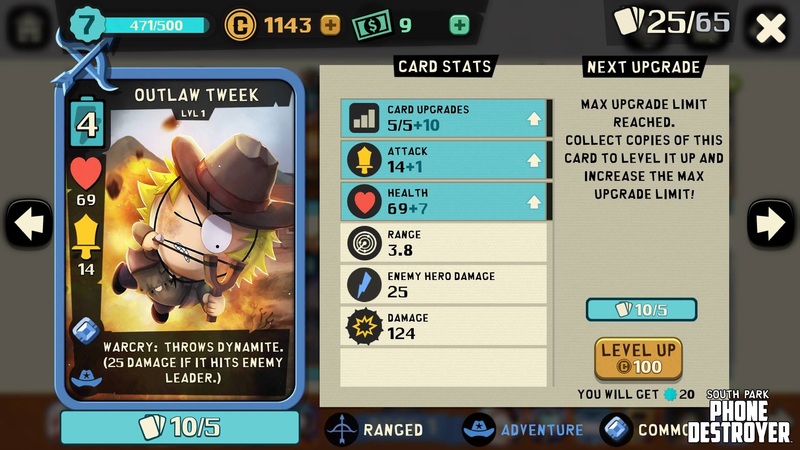 Below, we’ve put together a comprehensive guide on how to collect cards, upgrade cards, and build card decks in South Park: Phone Destroyer! One way to collect new cards in South Park: Phone Destroyer is by opening Loot Lockers. Win PvP Battles - Win three PvP battles to receive a free pack of cards. This offer refreshes every few hours, so be sure to participate in PvP battles whenever you load up South Park: Phone Destroyer. 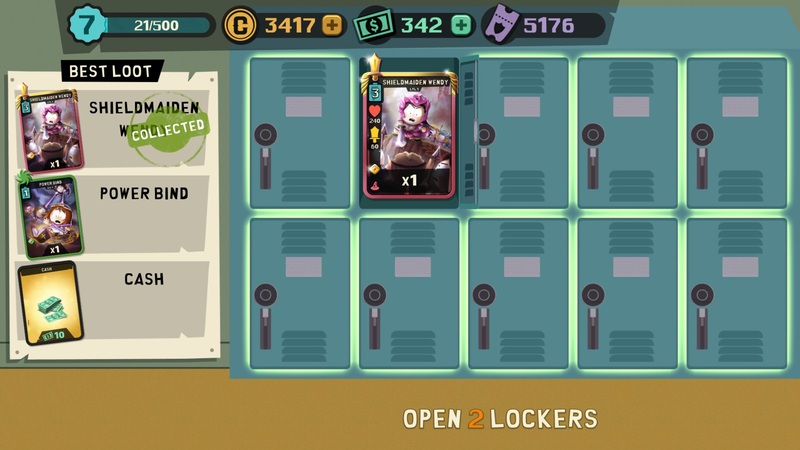 Open Loot Lockers - After winning a PvP match or stage in South Park: Phone Destroyer, you’re given the ability to open three Loot Lockers which can contain new cards. Again, this refreshes so be sure to prioritize PvP matches and stages in South Park: Phone Destroyer. Visit Cartman’s Shop - Every couple of hours, Cartman’s Shop will have a free pack of cards on offer, so be sure to check Cartman’s Shop regularly when playing South Park: Phone Destroyer. Visit Butter’s Shop - You can use your PvP Tickets to purchase specific cards in Butter’s Shop. The cards on offer rotate often, so be sure to check Butter’s Shop daily for new card offers. Use the Premium Shop - Finally, you can exchange Dollars for specific cards in the Premium Shop. To earn Dollars, you can either spend real money via microtransaction, or grind for Dollars by completing in-game achievements and opening Loot Lockers. To upgrade your cards in South Park: Phone Destroyer you'll need to collect Upgrade Coins. In addition to acquiring new cards, upgrading your cards can help you have an easier time in South Park: Phone Destroyer. In the game, there are two primary ways in which you can upgrade your cards. First, by upgrading your card, then by leveling it up once it’s capped out. Below, we’ve got into more detail regarding the process of upgrading your cards in South Park: Phone Destroyer. How to Upgrade Your Cards - To upgrade a card in South Park: Phone Destroyer, you’ll need to collect various Upgrade Coins and materials. These can be found in a variety of places including the Coin Shop, the PvP Ticket Shop, Loot Lockers, and Card Packs. Upon collecting enough materials, head to your Deck Builder and tap on the card to upgrade them. How to Level Up Cards - After fully upgrading a card in South Park: Phone Destroyer, the next way to improve it is by leveling it up. To level up a card, you’ll need to acquire a set number of Coins and duplicate versions of that card. With those available, head to your Deck Builder and tap on the card to level it up. After leveling a card, it’ll be upgradeable once more. Each time it reaches its upgrade cap, you’ll need to level it again in order to continue upgrading it. This process can be repeated until you’ve maxed your card out. Use your best cards to build solid card decks in South Park: Phone Destroyer. 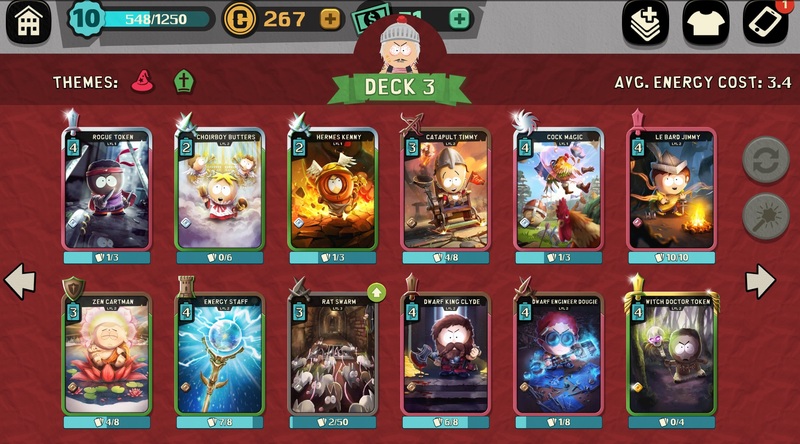 Finally, once you have the cards you desire or have upgraded your cards to your liking, you can begin the process of building your card decks in South Park: Phone Destroyer. Each card deck in South Park: Phone Destroyer is limited to 12 cards total. Additionally, you won’t be able to play two cards that feature the same South Park character. As such, you’ll want to build your deck using unique characters and two set Themes. Keep this in mind while upgrading and leveling your cards, as each card deck should be cohesive in order to succeed in South Park: Phone Destroyer. Try to balance your card types, characters, and themes when building new card decks in South Park: Phone Destroyer. Finally, pay attention to the card types added to your card decks in South Park: Phone Destroyer. In the game, there are 5 total card types available. Be sure to have a decent mixture of each available card type when building a new card deck. Below, you’ll find a list of all available card types in South Park: Phone Destroyer. Assassin - In South Park: Phone Destroyer, the Assassin card type can be used to summon an Assassin character. Assassin characters have a limited health pool, but deal high damage. Fighter - In South Park: Phone Destroyer, the Fighter card type can be used to summon a Fighter character. Fighter characters have a moderate health pool and deal moderate damage. Ranged - In South Park: Phone Destroyer, the Ranged card type can be used to summon a Ranged character. Ranged characters have a limited health pool, but deal high damage from a safe distance. Spells - In South Park: Phone Destroyer, the Spells card type can be used to cast a Spell within a targeted area. Tank - In South Park: Phone Destroyer, the Tank card type can be used to summon a Tank character. Tank characters have a huge health pool, but limited damage. And there you have it, a look at how to collect new cards, upgrade your cards, and build card decks in South Park: Phone Destroyer. What’s your favorite card in the game right now? Let us know down in the comments below! 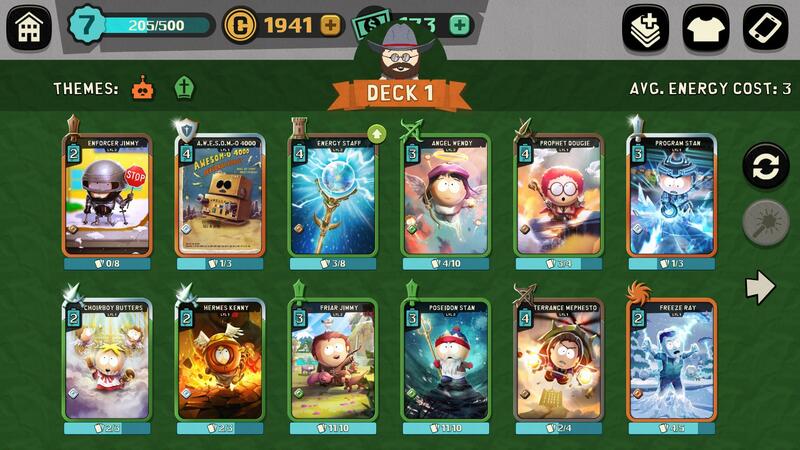 By reading through this guide, you should now know how to collect cards, upgrade cards, and build card decks in South Park: Phone Destroyer.